The Desi to Pardesi project was funded by the Heritage Lottery Fund (HLF). 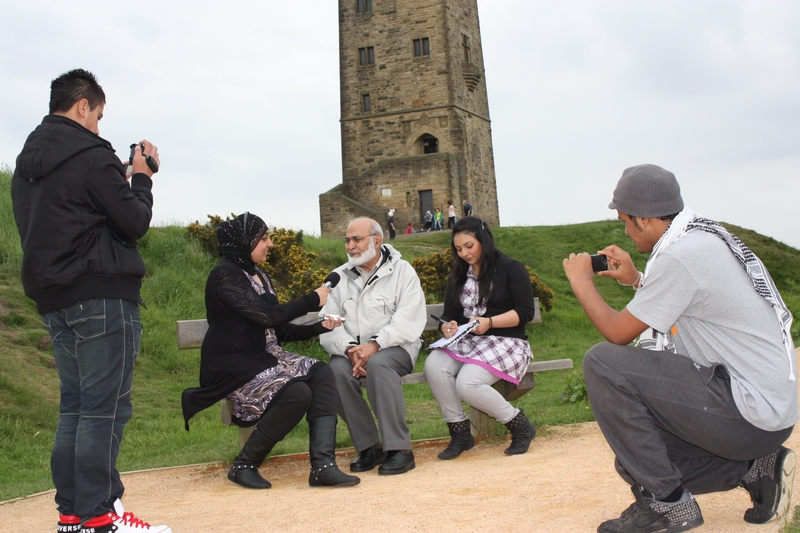 It was aimed at researching, recording, sharing and archiving the experiences of first generation Pakistani arrivals in Huddersfield and neighbouring towns. These people lived, worked and contributed enormously to the prosperity of the town and continue to enrich it’s in different ways. There is, however, very little known about the experiences of these early settlers beyond general stereotypes and clichés. An almost forgotten and invisible minority that was greatly misunderstood who never had an opportunity to put their point of view across. Young people rightfully resent the negative image attached to their parents and grand parents coming to the UK. They strongly object to their forefathers being described as parasites, scroungers and ‘not fit’ for anything and an undesired ‘burden’ on the state. They wanted to put this record straight: the arrival of the first generation Pakistanis to the UK was no accident. They were invited by the UK Government to work in mills and factories in order to bolster the British economy. They became the backbone of British textile and heavy industry, taking up jobs considered not worthy by the white indigenous workforce- low paid, dirty, night work, shift work and long hours. British young people of Pakistani origin strongly feel that the legacy of negative stereotyping of their first generation is being transferred on to them. Old myths and prejudices continue to survive and impact on their image and life chances. They felt passionately about putting the record by rediscovering the experiences, tribulations and achievements of their elders in Huddersfield. The entire project from the start to finish was a rewarding experience for all involved- young people, facilitators and interviewees. The project team was able to learn from the first hand experiences of all the interviewees, be challenged and compelled to revise their perceptions and understanding of different aspects of this fascinating continuum, in their journey to appreciating their identity. “…in the immediate aftermath of the (second world) war, Britain in particular was experiencing shortage of manpower for its many mills and factories. Immigration from Pakistan, India and Bangladesh was the need of the time. The country and its economy had to be rebuilt. We from the South Asia were invited to rebuild the country and its economy” Sher Azam arriving in 1961.